This time I will be talking about so-called "Smart meters" since both my antiquated electricity meter and gas meter were recently replaced. 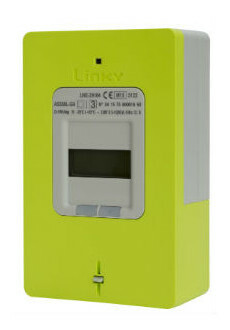 Linky is the name for the French electricity smart meter. They are manufactured by different companies but all have exactly the same flashy green colour! Linky is highly controversial but not for the right reasons IMHO. Opponents seem to concentrate on false and bizarre statements about radiations when they don't assert the meter embarks a camera! Long term loss of job (meter reading people) and above all the risk of privacy breach (it is technically possible to know how much electricity is used in real time hence to know what are people's daily routine and/or if they are on holiday, etc...) could have been causes worth a battle. But honestly opponents only managed to discredit themselves and look like a bunch of lunatics! Let's not forget that the original reason behind the arrival of smart meters is (by extension with smart grids) to be able to better handle the production of electricity by "green" means (wind, solar, ...) which are highly unpredictable and require to collect real time usage to try to balance production and consumption. The fact you can now be charged with real amount rather than estimates and you don't have to be home any more to open the door is a real bonus too. Note that in France, contrary to some countries like the UK, you don't have a "smart energy monitor" in standard. This kind of display with the current consumption in currency seems to be given only to the poorest families. AFAIK there isn't any similar solution sold yet. There is a slot for the emitter module ("ERL") and "Teleinfo" is available! Hurrah! So my first task was to create a MQTT/Wifi module to transmit the real time data. I'll give all the information about it soon. 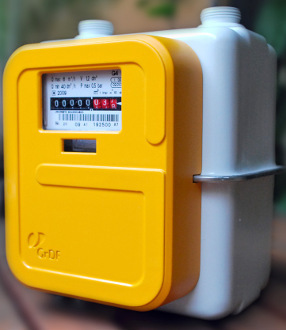 The smart gas meter is called Gazpar and is controversial too (obviously!). The transmission of information is slightly different. First it is only one-way and for reading: Nothing can be done remotely. Reading are transmitted by FM then mobile network twice a day. It is like a old "dumb" meter clad in an bright orange cuirass. For me the main issue is the loss of the magnetic pulse reading. I actually suspect that is is used internally by the Gazpar electronics but it is no longer available for personal use. There is a "socket" but I can't find much information about how to use it (dry contact? Not so sure specially that the battery should last 20 years and in theory the fact that something is plugged in is sent to gas provider) and I am rather shy to try anything. If someone has any information about it... Please contact me. The good news is that there is a shiny "6" on the litre digit so, reusing the old electricity light sensor, I am able to count the "pulses". Le compteur gazpar est équipé d'une prise. Cependant quasiment aucune information à ce sujet n'est disponible. Cela pourrait être un contact sec mais j'ai du mal à croire qu'il s'agisse d'un relais (avec une pile qui doit durer 20 ans et du fait que l'utilisation/occupation de la prise semble faire partie des informations remontées). Je suis preneur de toute information à ce sujet... Merci d'avance. The cable is for sale on (at least) two online shops. By the time you add VAT and postage, it's almost 20€ or 24€ (horrendous for what it is) but let's hope the price will go down with time. 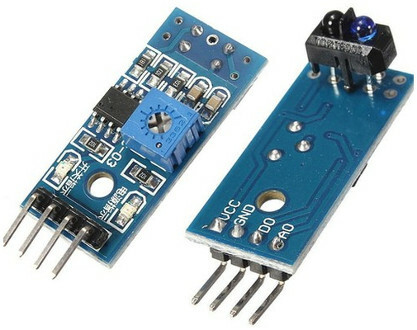 Regarding how it is connected internally, I still haven't been able to find any documents but my best guess is that there are 2 reed switches bundled together, one used for the internal counter, the other one directly connected to the socket.